Scathing critiques of the Food and Drug Administration's (“FDA”) performance by the Government Accountability Office and Institutes of Medicine, a plummet in innovative new drug approvals in spite of significant annual investment increases in biopharmaceutical research and development (“R&D”), and market controversies such as the painkiller Vioxx and the diabetes drug Avandia (both associated with significantly escalated risks of heart attacks and strokes) have raised doubts about the sufficiency of FDA *364 regulation. This Article questions how prescription medicines reach the market and proposes law-policy reforms to enhance the FDA's science standard for human clinical trials and new drug approvals. The core message is that relying too heavily on clinical research data generated through the global “gold standard” of group experimental design--reliance on statistical analysis to compile and compare group averages--risks predicting little about the actual impact of prescription medicines on individuals, including members of the groups under study. This Article introduces a law-policy methodology based upon commercial incentives and intervention by Congress and the FDA to raise the science standard for human clinical research, and to make drug development more closely parallel the reality of drug delivery in the practice of medicine. 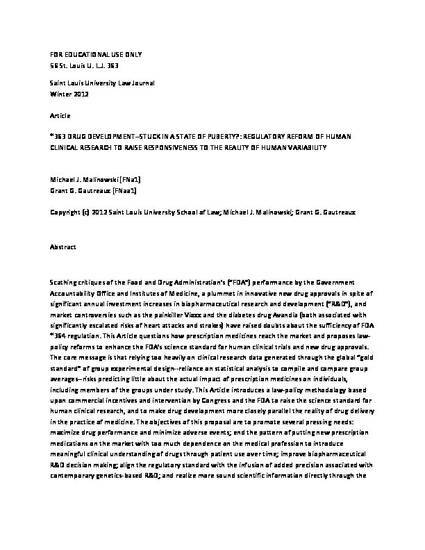 The objectives of this proposal are to promote several pressing needs: maximize drug performance and minimize adverse events; end the pattern of putting new prescription medications on the market with too much dependence on the medical profession to introduce meaningful clinical understanding of drugs through patient use over time; improve biopharmaceutical R&D decision making; align the regulatory standard with the infusion of added precision associated with contemporary genetics-based R&D; and realize more sound scientific information directly through the regulatory process to support the integrity of science in an age of academia-industry integration, aggressive commercialization, secrecy in science, and constantly, rapidly evolving technology.